"0700 22 February 67," by Robert De Coste. The painting depicts a battalion of the 7th Cavalry going into action in Vietnam. CARS is the Combat Arms Regimental System, under which the combat arms units in the United States Army are organized. Before the adoption of the CARS, there was no satisfactory means of maintaining the active life of the combat arms organizations. Whenever the nation entered periods of military retrenchment, units were invariably broken up, reorganized, consolidated, or disbanded. During periods of mobilization, large numbers of new units were created. Changes in weapons and techniques of warfare produced new types of units to replace the old ones. As a result, soldiers frequently served in organizations with little or no history, while units with long combat records remained inactive. In the late 1950s requirements for maneuverable and flexible major tactical organizations demanded highly mobile divisions with greatly increased firepower. For this purpose the regiment was deemed too large and unwieldy and had to be broken up into smaller organizations. (Most artillery and armored regiments had already been broken up for flexibility and maneuverability during World War II.) When the division was reorganized under the Pentomic structure in 1957, the traditional regimental organization was eliminated, thus raising questions as to what the new units were to be called, how they were to be numbered, and what their relationship to former organizations was to be. What are the regiments organized under the CARS concept? Except for the 18 Army Reserve infantry regiments, those regiments organized under CARS may have elements in both the Regular Army and the Army Reserve. In the Army National Guard, each state has its own regiments. The number of CARS regiments varies as troop allotments change. The 1st Special Forces has elements in all three components - Regular Army, Army Reserve and Army National Guard. How were the regiments selected? What were the phases in which CARS was instituted? How were the regiments reorganized under CARS? Since Phase V (organization of regimental headquarters) of CARS was never instituted, who has custody of the regimental colors, properties, etc.? The lowest numbered or lettered active element of the regiment normally has custody of the regimental properties. If, however, the lowest numbered or lettered active element is unable to care for the properties, they may be transferred to the next lowest numbered or lettered active element. If a numbered or lettered element of the regiment is activated lower that the one having custody of the regimental properties, the propertie will not necessarily be transferred. What is the difference between a brigade and a regiment? In a regiment not organized under CARS, there is a fixed number of organic elements organized into battalions or squadrons. For example, the infantry regiment of World War II contained Companies A through M divided into three battalions, plus supporting elements such as the service company. A brigade, on the other hand, is a flexible organization; it has no organic, permanently assigned elements. A brigade may have several different kinds of units attached to it, such as three infantry battalions, a cavalry troop, an engineer company, and other supporting units. In tactical structure, therefore, it is very similar to the regimental combat team of World War II and Korea. Its maneuver (infantry and armor) elements are not required to be from the same regiment. Since they are flexible, except for the headquarters and headquarters company, no two brigades need be alike, whereas all regiments are fixed with organic elements provided for under basic tables of organization and equipment. How are battle honors displayed? What insignia do members of CARS regiments wear? Who selects what elements of the CARS regiments will be activated? The Adjutant General controls the designations of elements to be activated and coordinates his selections with the Center of Military History. "America's Pride: Famous Old Regiments to Get New Life," The Army	Reservist, III (October 1957), 10-11. Atwood, Thomas W. "A Hard Look at CARS," Armor, LXXII (July-August 1963), 19-22. Bourjaily, Monte Jr. "Battle Honor 'Lies' ", Army Times (10 March 1962), 13. _____. "Unit Homes in '57?" Army Times (29 December 1956), 1, 35. Danysh, Romana. "What's the History of Your Unit?" 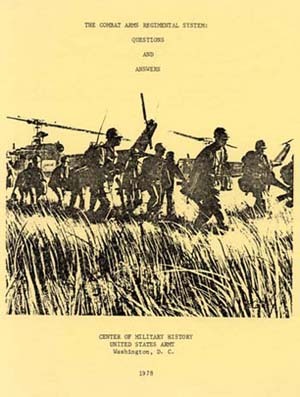 Army Digest, XXII (December 1967), 12-15. Department of the Army. Army Regulations. 870-5, Historical Activities: Military History - Responsibilities, Policies and Procedures. 22 January 1977. Dupuy, R. Ernest. "Our Regiments will Live Forever," Army Navy Air Force Register, LXXVIII (September 1957), 3. Eliot, George Fielding. "Army's Future Tightly Linked to 'Future of the Regiment,' " Army Times (June 1955). _____. "The Combat Arms Regimental System," Armor, LXVI (November-December 1957), 18-21. Keliher, John G."CARS is OK. It Can Do the Job," Army, XI (May 1961), 70-71. Mahon, John K. and Romana Danysh. Infantry. ARMY LINEAGE SERIES. Washington: Government Printing Office, 1972. Pages 87-100. McMahon, Walter L."CARS '75; Permanent Headquarters for the Combat Arms Regimental System." US Army War College Research Paper, 31 October 1974. Palmer, Bruce Jr. "Let's Keep the Regiment," Army Combat Forces Journal, V (May 1955), 22-23. Sinnreich, Richard H. and George K. Osborn. "Revive the Regiment, Rotate, and Reorganize," Army , XXV (May 1975), 12-14. Stubbs, Mary Lee and Stanley Russell Connor.Armor-Cavalry. ARMY LINEAGE SERIES. Washington: Government Printing Office, 1969. Pages 81-83.